It works as follows: Boxes, coming from an upstream machine e.g. 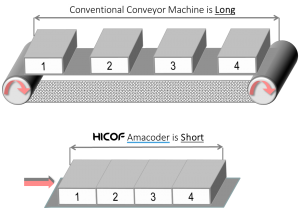 a cartoner or checkweigher, are transported by a conveyor to the infeed plate of the Amacoder (this conveyor is not part of the Amacoder and must be provided by the Customer). 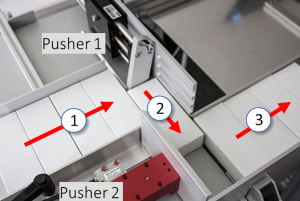 A feeding pusher (1) from the side shifts incoming boxes laterally onto the transport slide, in front of a second pusher (2) which shifts the boxes through the Amacoder. After a stroke of the pusher, it retracts to its initial position, leaving room for new boxes, introduced from the side. 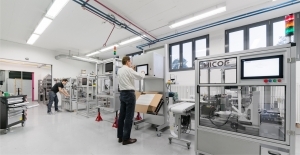 This cycle is repeated permanently, resulting in an indexed, highly controlled movement of the stack of boxes (3) through the machine.